Get Ready, Get Ready, Get Ready! I'm already ready and pumped. Got two of my Boys coming and I can't wait. 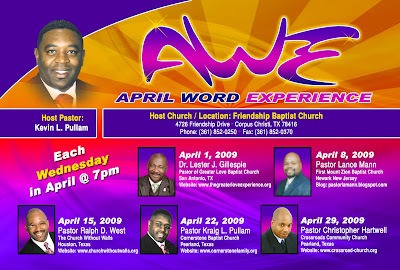 I will definately have to cancel a previous engagement that will hinder me being there for Pastor Lance's A.W.E. night. My prayer is to be there each Wednesday evening in April. Thank you Pastor Kevin, not only for your great preaching, but also reaching. I love you.